"A Guardian breaking into the Warmind's bunker does nothing for our efforts to make true contact with Rasputin. I've tasked several of my agents with unraveling his response. However, the Guardian is now prepared for the assault on Crota's realm. Just a warning, many thanatonauts are standing by, anxious to learn if this works"
The Promethean Code is the sixth story mission in Destiny The Taken King. It takes place in the Cosmodrome Old Russia and the Guardian's objective is to steal stealth tech from the Warmind Rasputin. Eris Morn: Stealing from Rasputin... you are entering a world you do not understand. Cayde-6: Oh, don't worry about her, Guardian. She's still mad about what you did to her ship. We need cloaking tech to slip past the Taken and the Warmind bunker's got the code we need. Ghost: After all this time... how can we be sure Rasputin has the code? Cayde: I already stole it once. Used my last copy making that stealth drive you blew up. Eh... it was... getting old anyway. The Guardian mounts their Sparrow and heads into the Forgotten Shore, reaching Rasputin's bunker underneath. Ghost: I haven't had much luck breaching Rasputin's security. Eris: He will protect his domain. Ghost: More interdimensional goo—the Taken are here. Cayde: What? Not possible. We sealed the complex after the Omnigul breach. Ghost: Cayde, look at this. Larger spots and portals are seen as they head in deeper. Cayde: Oh, that does look bad. Okay, so if you see 'em, uh... just shoot 'em. How did they even get in there? Eris: The Taken are not bound by terrestrial constraints! Cayde: Yeah, I'll bet they'll be constrained by terrestrial bullets. Taken appear within the Seraphim Vault, attacking the Guardian. They eliminate the deformed Thrall, Vandals and Captains. Heading towards the control room where they previously encountered Omnigul, they find the doors locked. Ghost: Cayde, your bypass codes aren't getting us through these doors. Cayde: Omnigul's screams have already been silenced. There's nothing in there but bad memories. Eris: Rasputin will give only what you need... nothing more. Cayde: Don't worry—the good stuff is below you. Keep moving. 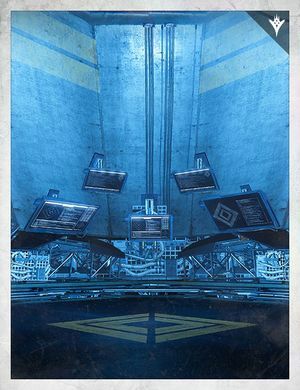 Cayde: It's a surveillance port for the weapons test lab on the other side of the glass. There was an attempt to co-opt early Fallen technologies. Not tremendously successful by most reports. The Guardian moves on, into a nearby hallway. Ghost: I can't believe the Taken can track us so easily... Oryx really does hate us! Cayde: Which is exactly why we're here! We need those cloaking codes. Ghost: This was the first station to come back online after the Collapse. Shortly after that, Rasputin regained control over the entire facility. But it all started here... maybe... Rasputin didn't wake himself? Ghost: Oryx views Rasputin as a threat: If we could gain control over his reach and wake all of the Warmind systems, we could see everything the Hive hidden from us. No wonder he wants it destroyed. The Guardian goes through the door and continues down the hallway. They reach a dead end; Rasputin's main computer room. However, Taken Centurions and Psions appear inside. The Guardian disposes of them and is left in peace. Cayde: All right... see what you can pull out of Rasputin... there's a joke there, somewhere. The Guardian sends their Ghost to the monitors. Ghost: These cryptosystems follow no logic I understand—I'm not sure it can be modified to work on a Guardian. Cayde:(proudly) Where do you think Bladedancers got their cloaking ability? (The next sentence is not spoken, but can be viewed in the subtitles) Grab the codes, I'll upload my modifications. Eris: If the Vanguard are satisfied, we can finally end this. Return to the Moon... steal Crota's soul. "So much of Rasputin remains a mystery, even after we found his Vault. To have these strange Hive fragments near him..not good." Ghost: These cryptosystems follow no logic I understand—Cayde, are you sure this will work on a Guardian? Suddenly, the panel the Guardian is standing on dislodges from the floor with a hydraulic hiss; the panel is a secret elevator. It leads the Guardian further below. Ghost: We lost him. Well, may as well have a look around. The elevator stops, reaching what appears to be a basement. Two ledges sit on either side of the walls. A second door opens up from the other end, and a Bracus steps out of it, followed by Taken infantry. Ghost: Great. Hope we get some better pants out of this. The Guardian kills the Taken enemies and receives a strange object, the Essence of the Feast.